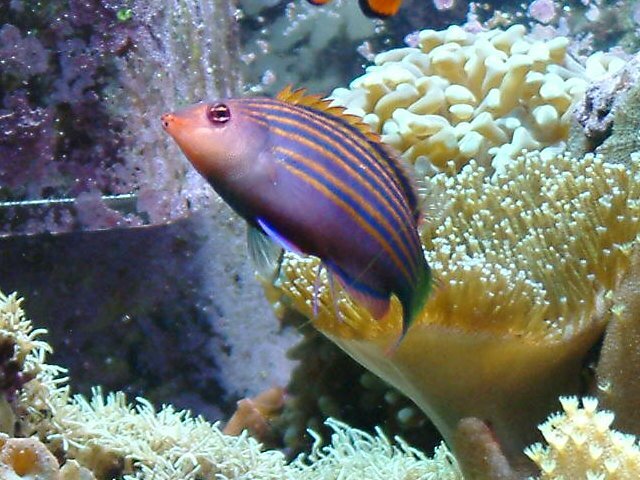 This is Spike, my Six Line Wrasse. 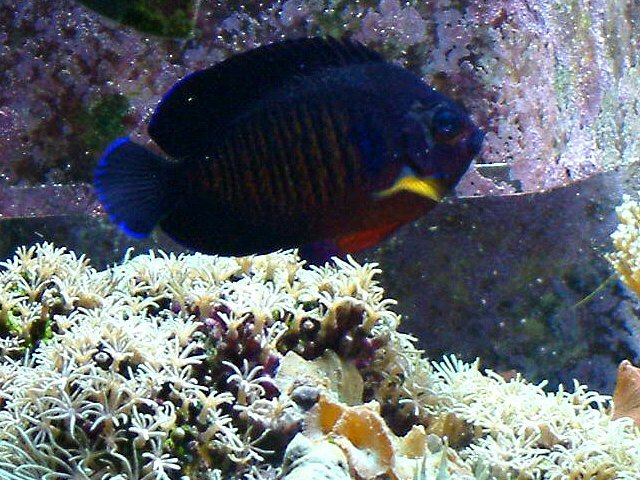 Originally he was purchased to help consume flatworms (red planaria), but he never showed any interest in those. 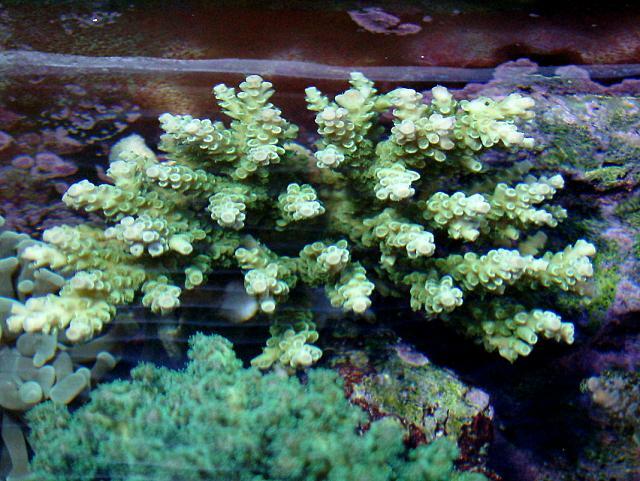 This Acropora sp. 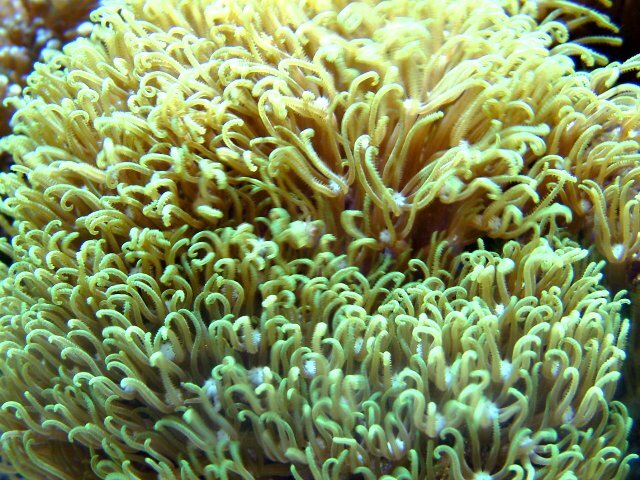 colony was bright-light yellow. It darkened up under my Metal Halides, turning a nice avocado green. 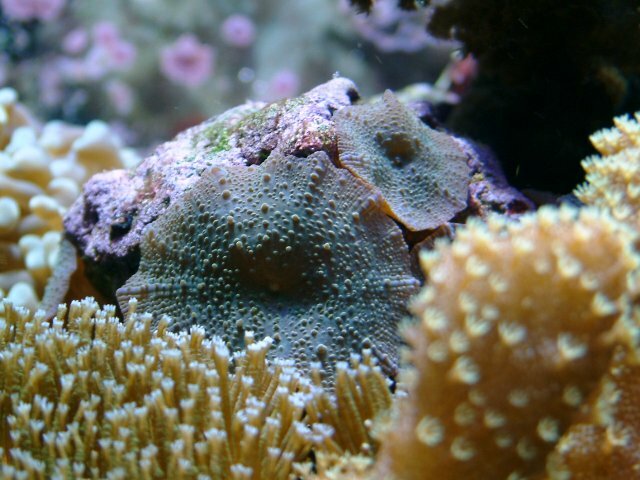 Polyps are brown in the main section, but new growth has purple polyps at the tips! 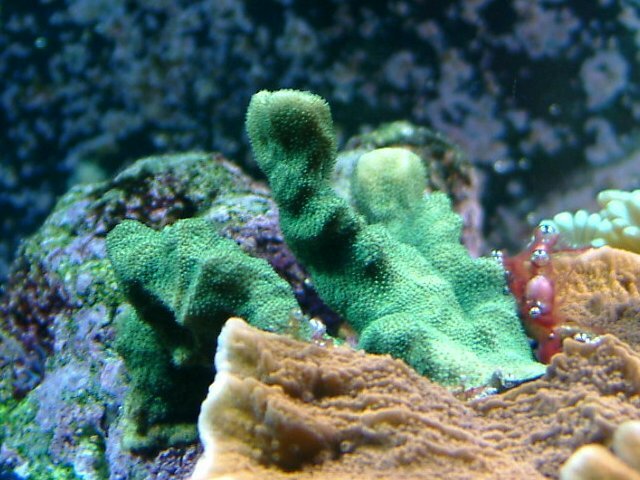 I've had this small frag since August 2003, but growth has been very slow. It really doesn't have a good spot in my tank unfortunately, but it is hanging in there. You can see bluish tissue when you look closely. 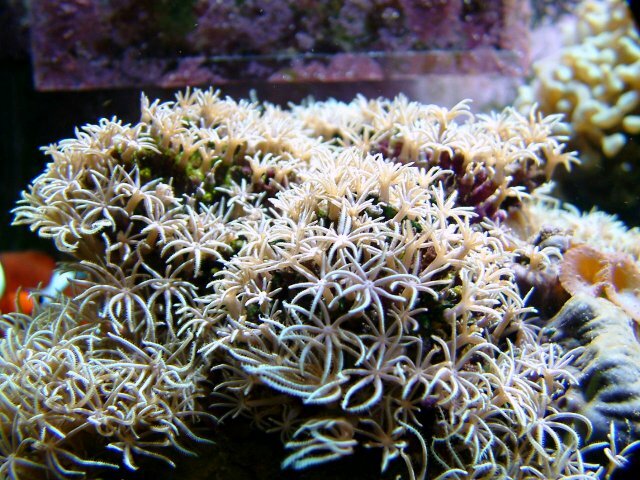 Alveopora is an LPS coral. 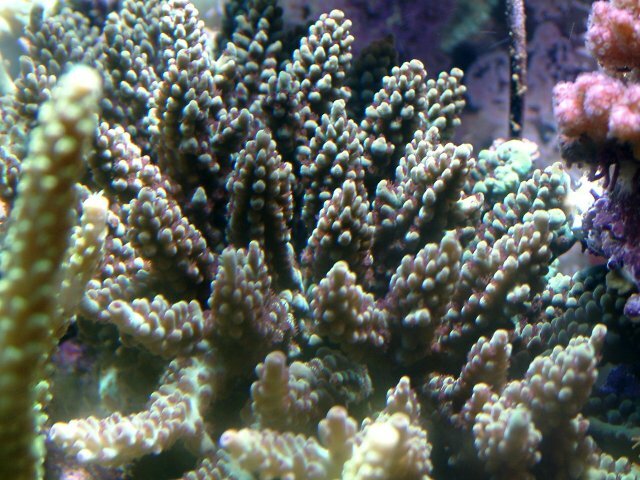 It is the green coral behind my orange Montipora foliosa (foreground). 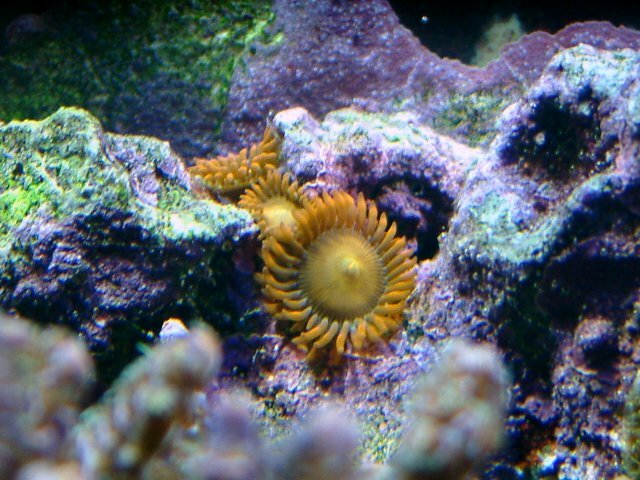 Aptasia has started to take over my tank. I'm trying to kill them with Joe's Juice, plus I added 9 Peppermint Shrimp to my tank. So far, I'm not making much progress. These are near the substrate and truly out of reach. 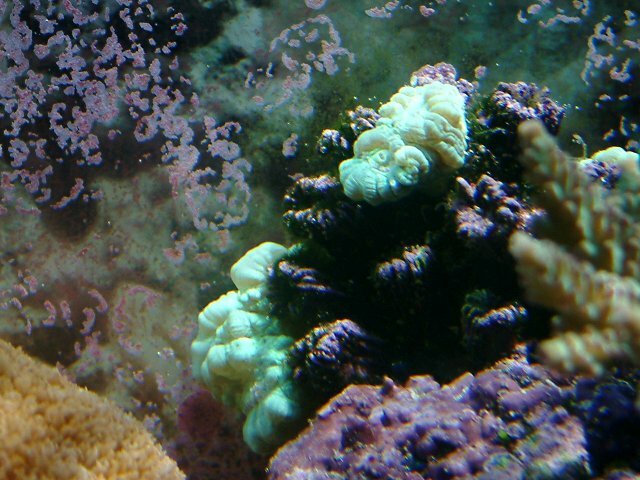 Cyano bacteria is on the substrate. 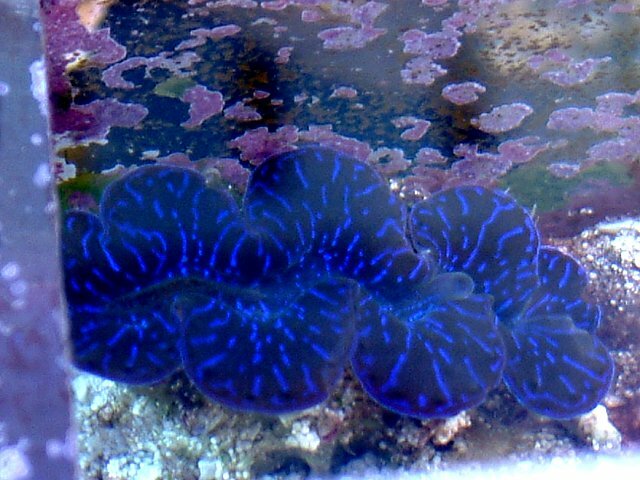 My baby Blue Maxima clam is about 1.5" in length. 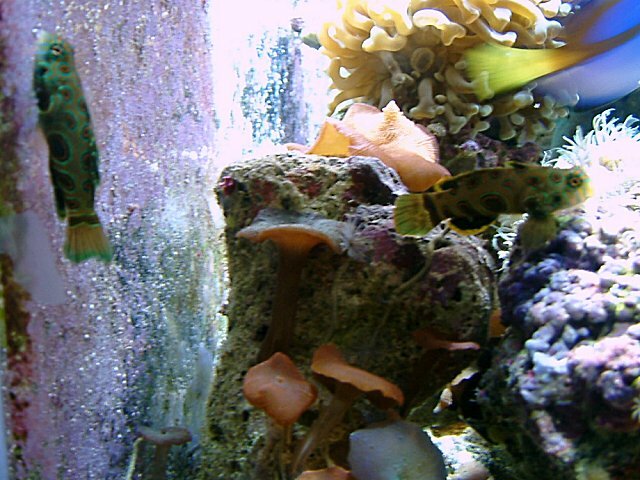 It is "hangin' out" in an acrylic tray suspended in the tank. 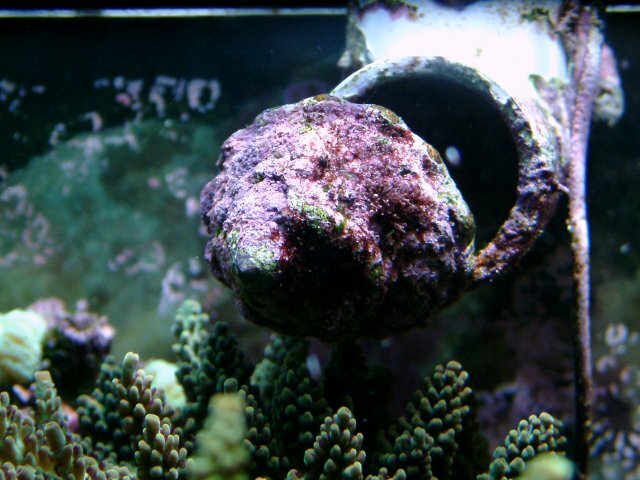 This keeps it safe from any whelks still in my reef. 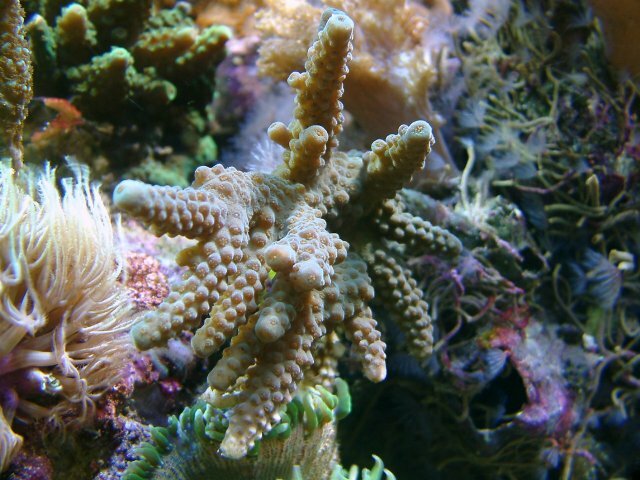 Blue-tipped Acropora sp. 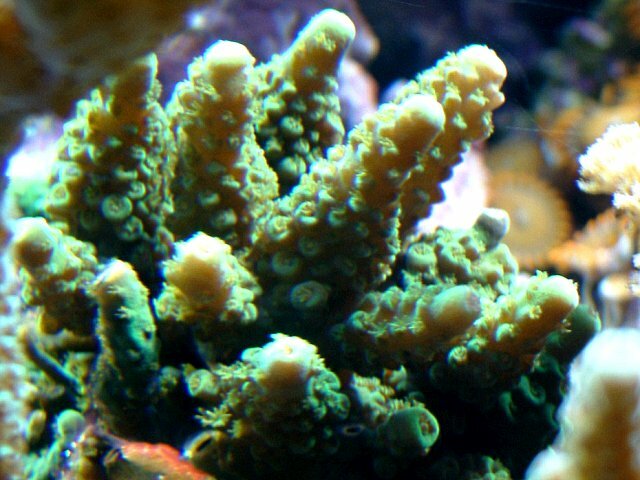 The tips are light blue, but the main coral is green under my lighting. 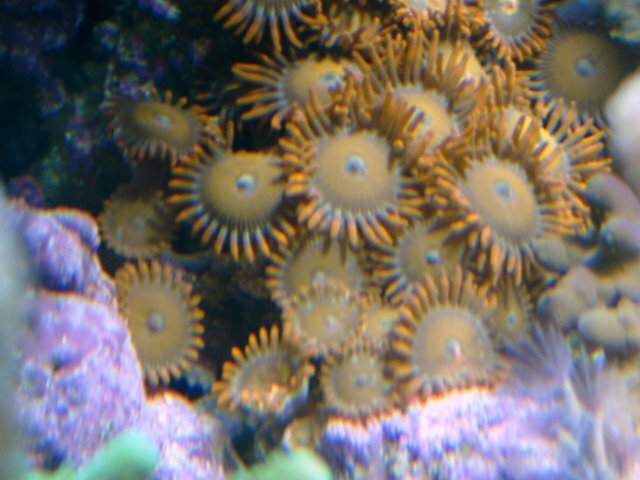 Bytor Orange zoanthids. 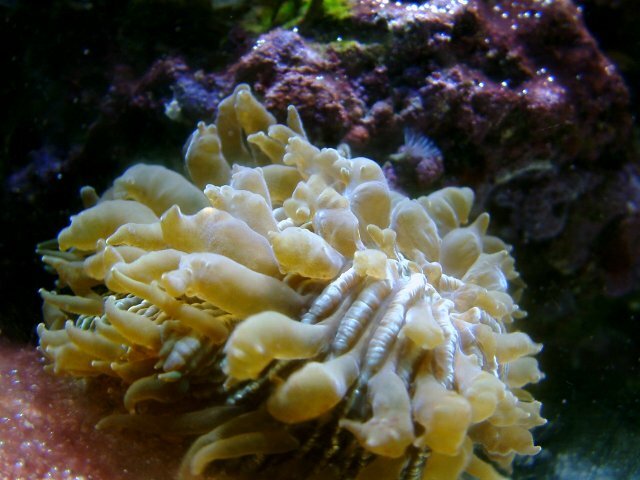 The main colony died, but a single polyp survived. Quietly a few have grown from this one, thankfully. 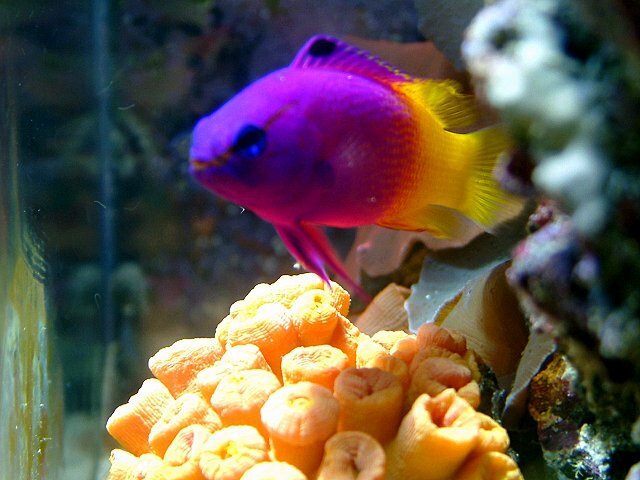 Neon Candy Cane coral. 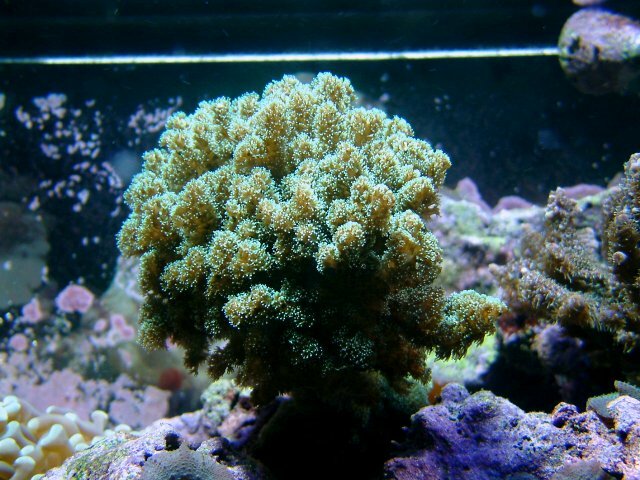 This is a frag given to me, and a few heads died, but others are doing well. I don't know if they can spread to the hold skeletal areas or not. 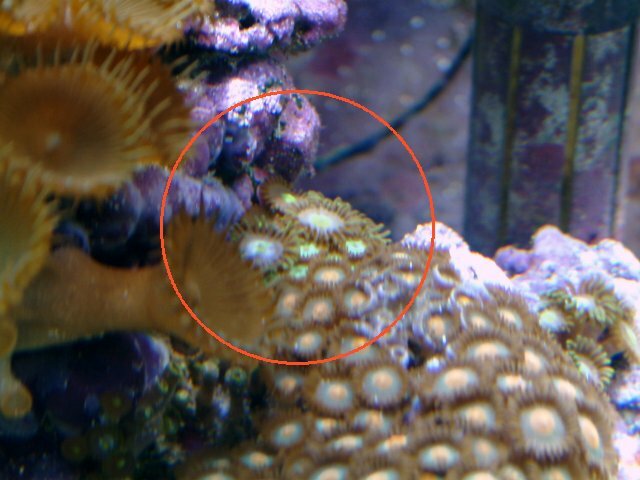 My Caulastrea (also known as Trumpet Coral) died last year, but after months in my sump I noticed new growth in the core of one socket. So it is back in the 55g where it gets light again. 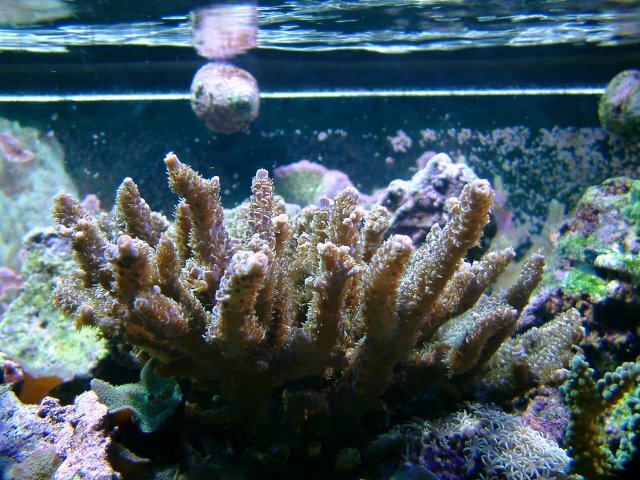 My original Colt Coral died in my 29g, but this is a frag of it that has hung in there, even after being bothered by the Goniopora in the background. 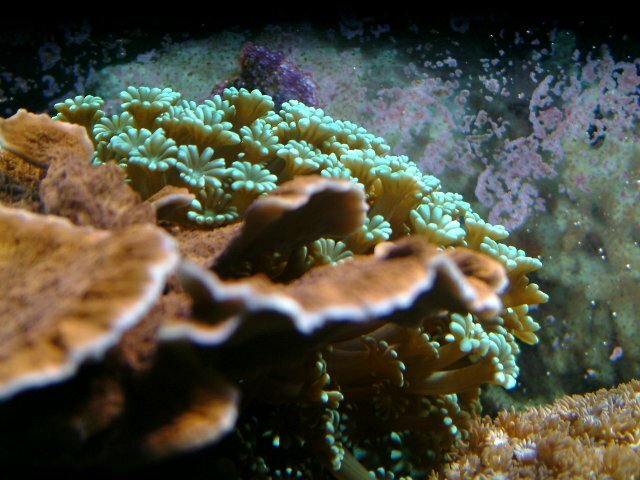 The Coral Beauty came with my 55g when I bought it. The area around the eye was badly deteriorated, but most of that healed over time. It is hard for me to get a picture of the pretty orange striping, but I don't use a flash. This Devil's Hand was about 1.5" x 3/4" when I got it a year ago. Now it is about the size of a child's catcher's mitt! It really is huge for my 55g. 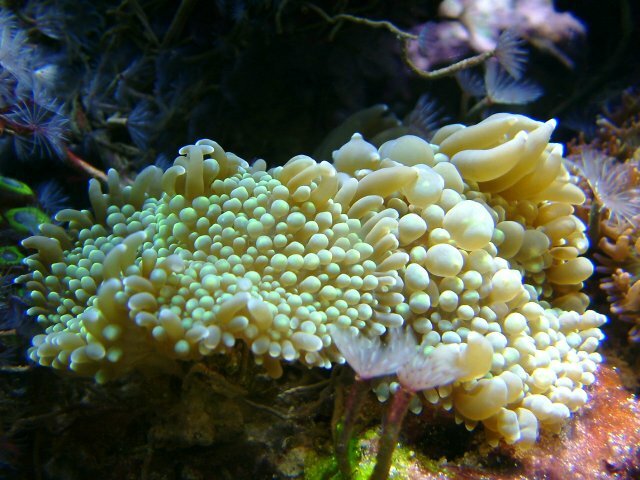 Moon Coral (Favite). It is doing nicely now that it is under MH. I got it from a club member with PC lighting and 50% of it was dead or dying. 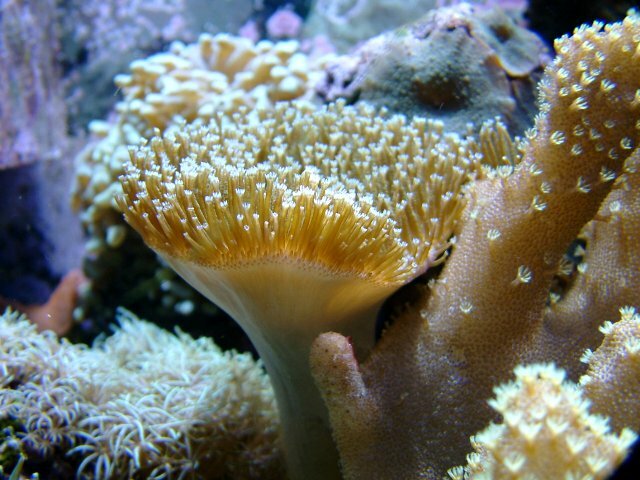 Plate Corals (Fungia) tend to have tiny tentacles, but not this particular kind. 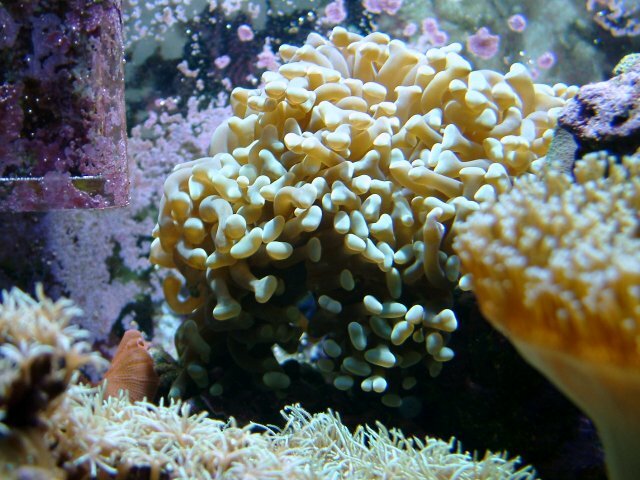 I can feed this coral some meaty foods, and usually drizzle some mysis or Cycop-Eeze on it when the circulation pumps are off. 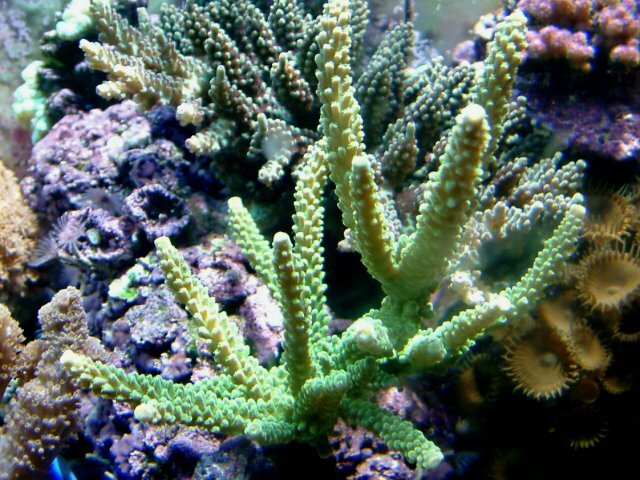 Fuzzy green Pocillopora. It has doubled in size in the past 9 months. 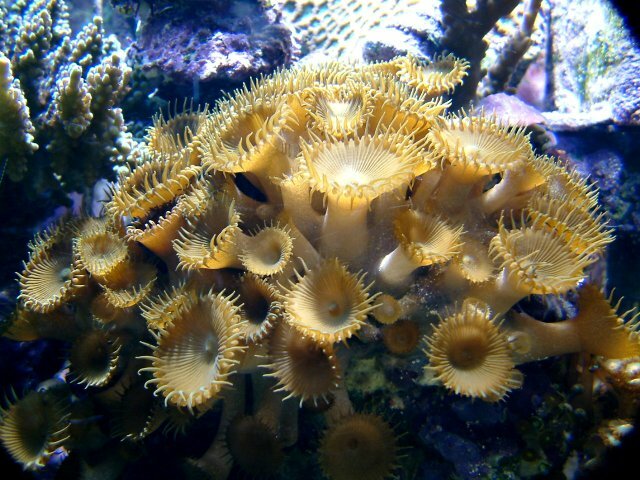 Golden Zoanthids, sandwiched between the Devil's Hand and the featherduster. 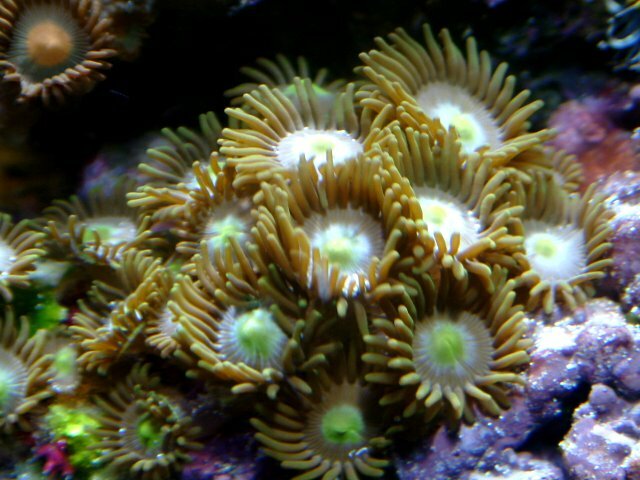 This Goniopora was fabulous when I bought it from a fellow reefer. 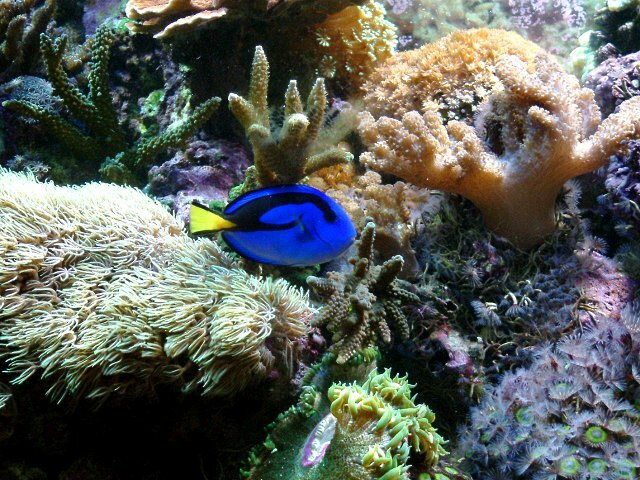 He'd had it 9 months in his reeftank, and even though we have similar setups, it has closed up quite a bit in my tank. Sigh. 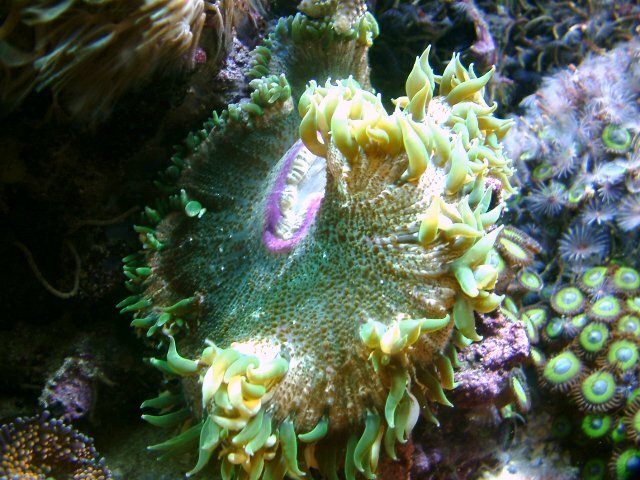 Green Ricordea. The one on the left is almost electric in color. 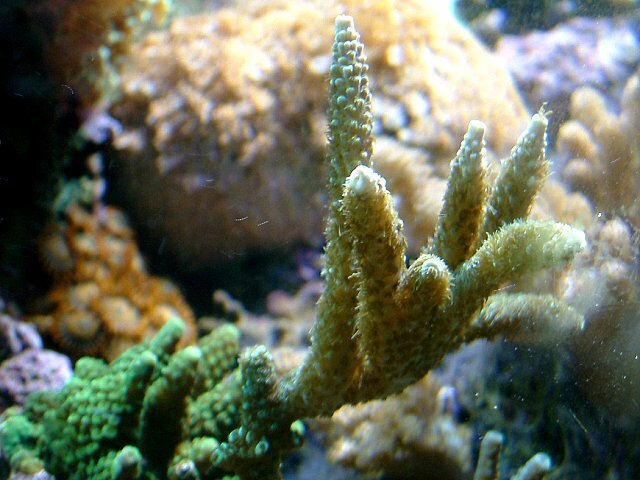 Acropora yongei. This green slimer has grown quickly in the past 5 months. Originally I had three small branches, but over time it has grown to over 14 individual ones! 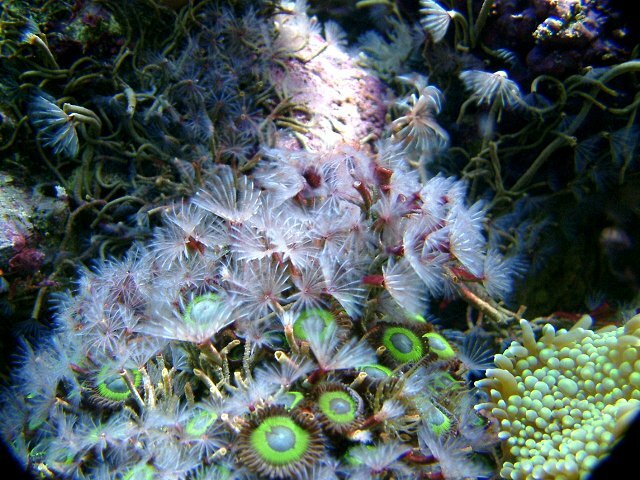 Green-rimmed zoanthids. These look much nicer under actinics. 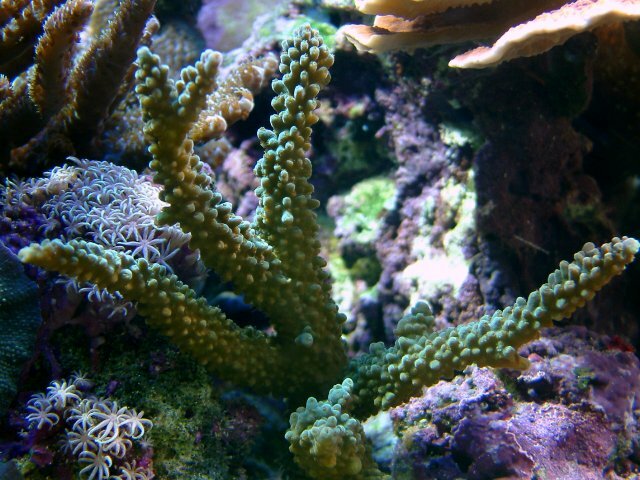 Fuzzy Acropora sp. Probably in the milleopora family. 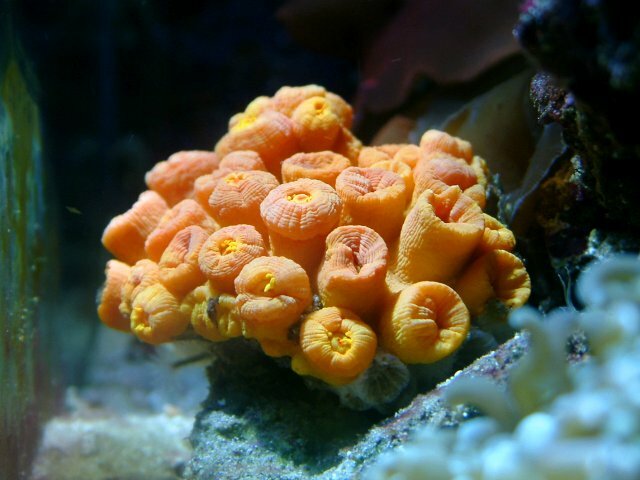 Hammer Coral. About 3 or 4 heads total. 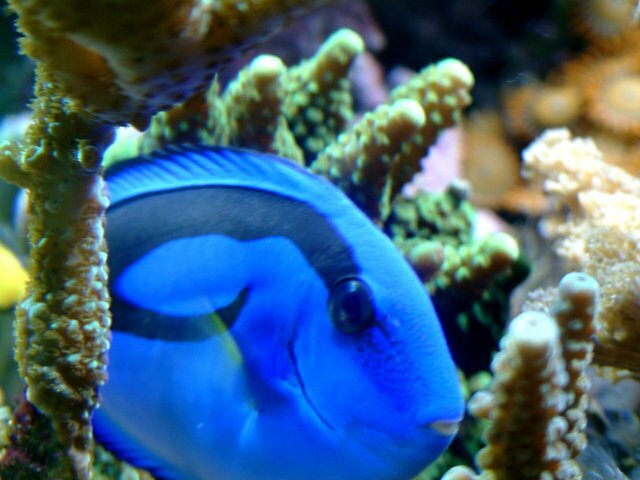 Tucker, my blue Hippo Tang. 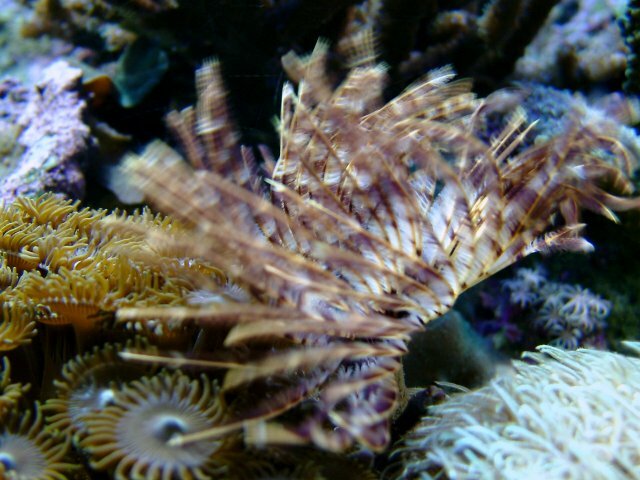 Acropora humilis. The skinny tips are new growth. My pair of Mandarins. 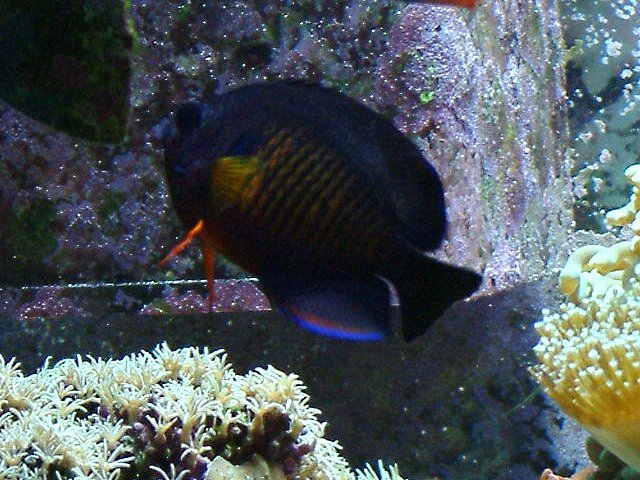 The vivid green one to the left is the male, the other is the female. She was orange when I bought her, but the color changed over time. It is very hard to take a picture of both of them together because they don't both hold still simultaneously. 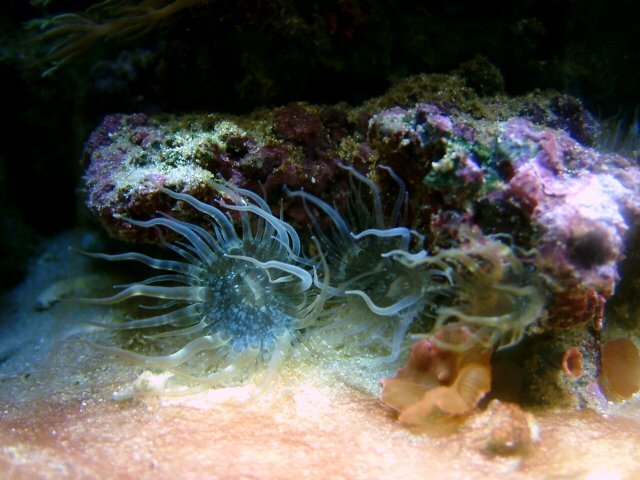 Plus they tend to travel together only when the main lights are off. Micro featherdusters. Everyone loves these hitchhikers. 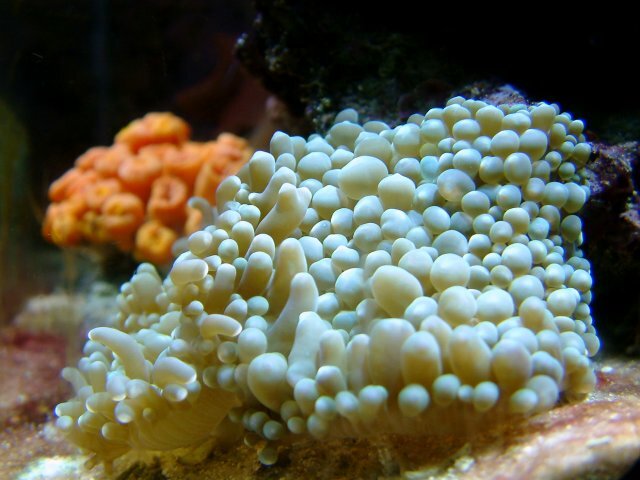 Montipora foliosa. 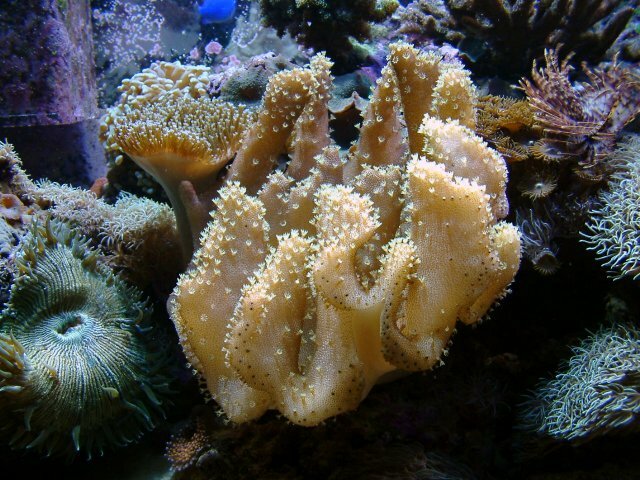 One of my favorite corals. 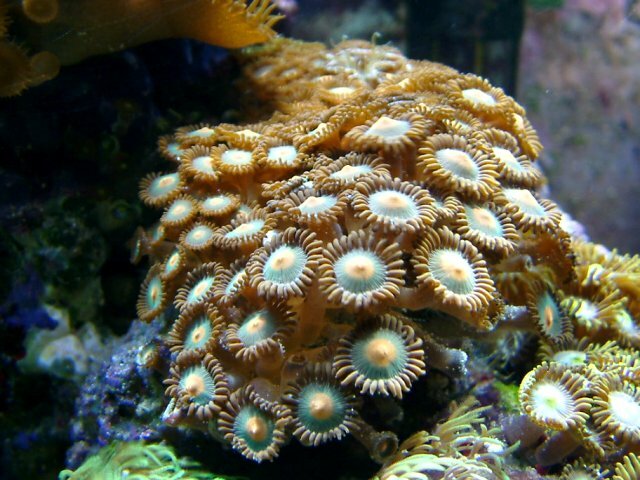 Melev's "Mean Greens" - These zoanthids are very popular. 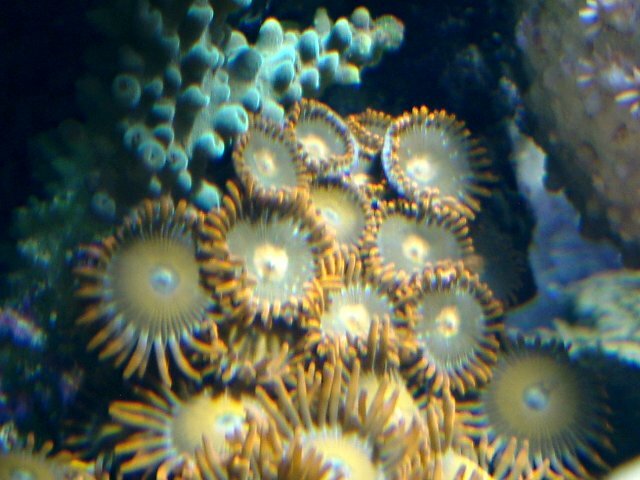 Orange Zoanthids. The rim was green originally but for some reason that color is morphing away. 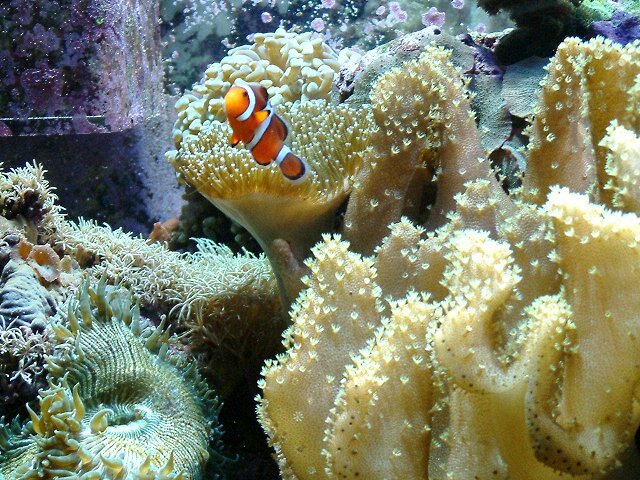 Orange Ricordea with green mouths. 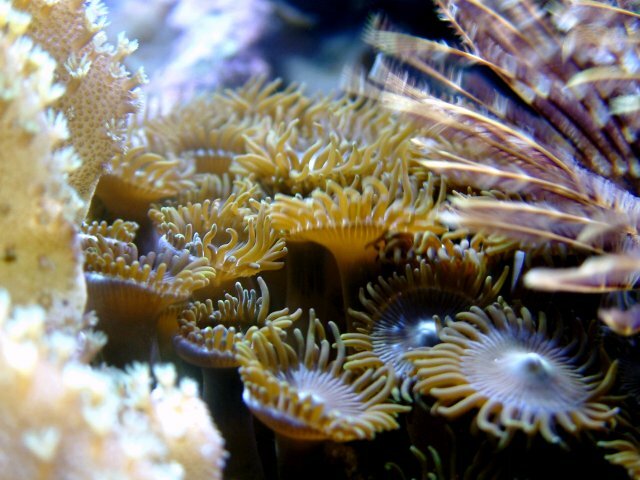 Palythoa - button polyps. 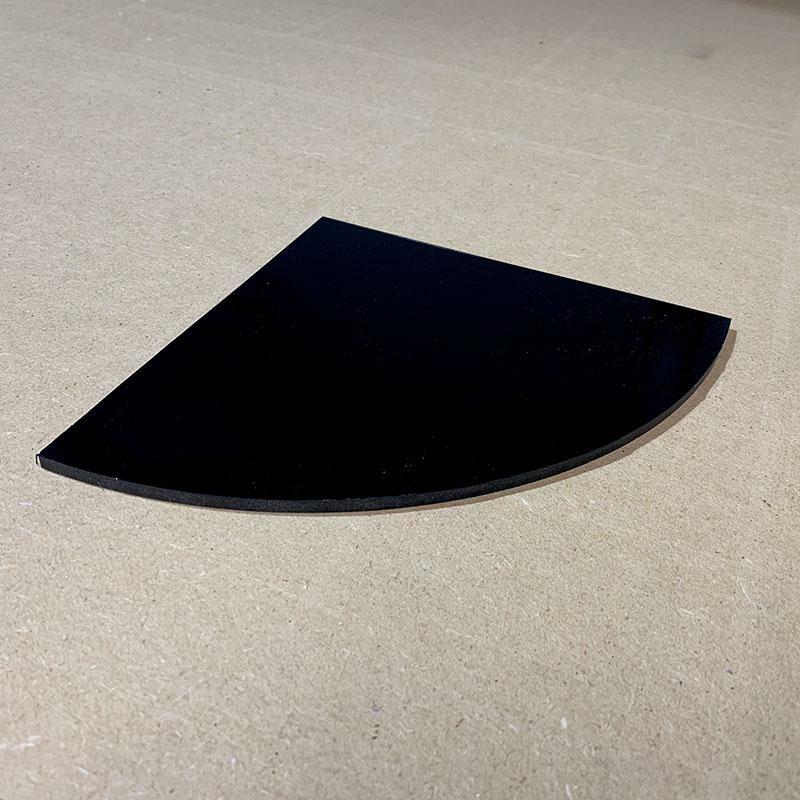 These extend from a common-base or mat. They are very slimy when handled, so I don't. 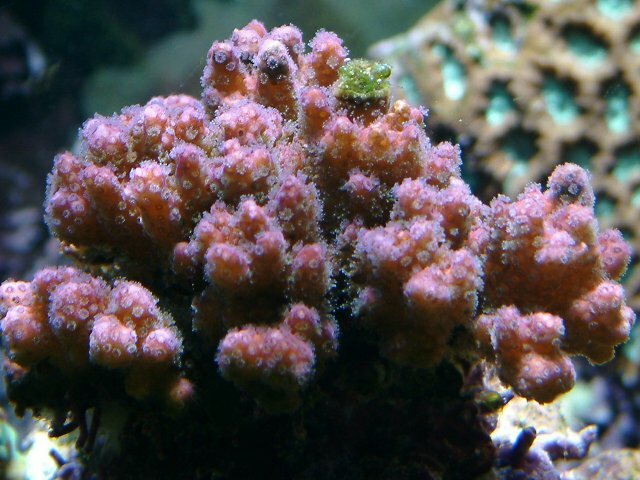 Pink Pocillopora. I have had these 2 years. Recently the bleached in my 29g under PC lighting, so I transferred them to my 55g and they have made a full recovery. 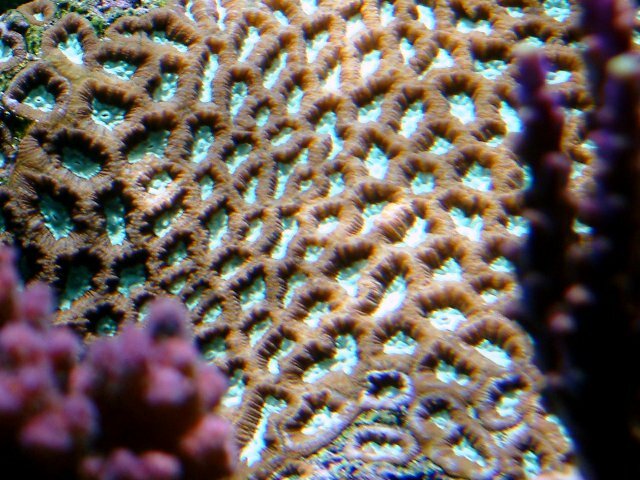 I need to trim off that piece of green algae so the coral will look perfect again. 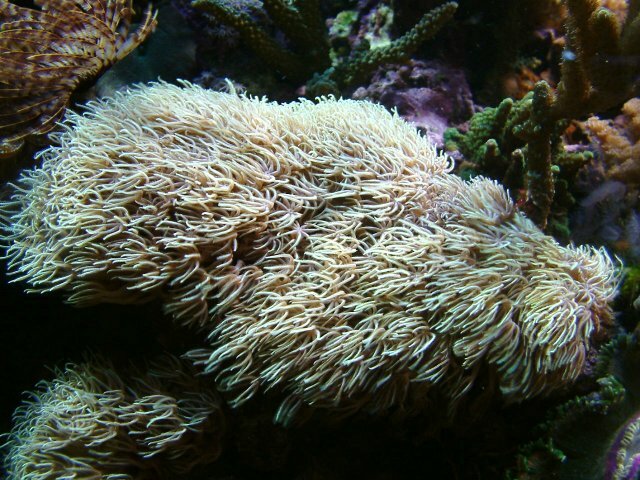 Love those tiny fuzzy polyps. 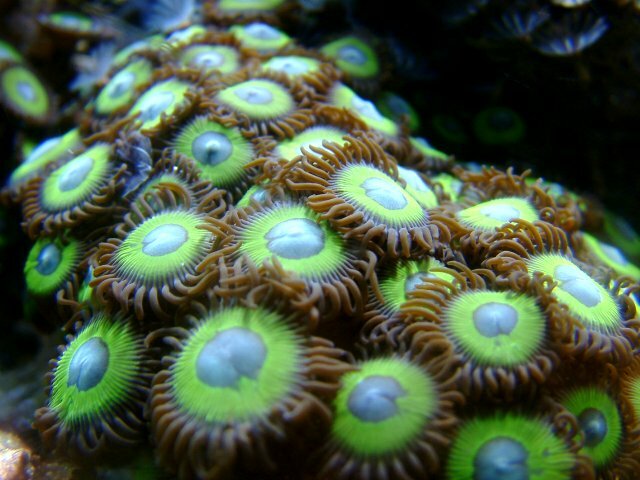 Bright green "plasma" centered Zoanthids. I only have a few and they are impossible to get a good picture from any angle at this point. Green Psammocora. This piece snapped off the original colony. It is a slow grower, but looks nice and healthy. 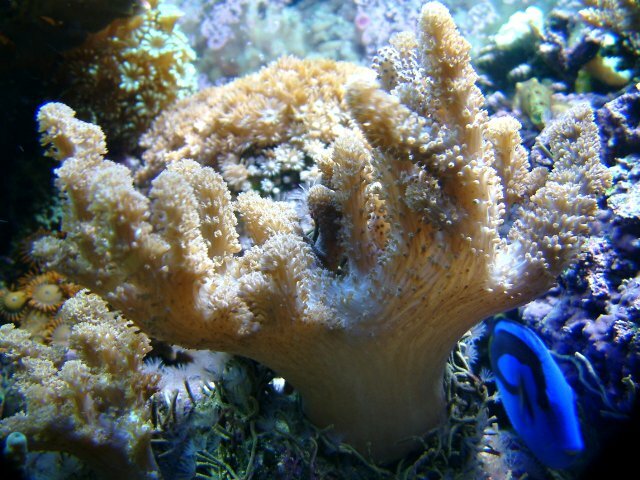 It is touching a part of a Montipora, and Cyanobacteria is visible in that spot most days. Tucker hanging out under his fuzzy acro branch. He likes to park and watch me. 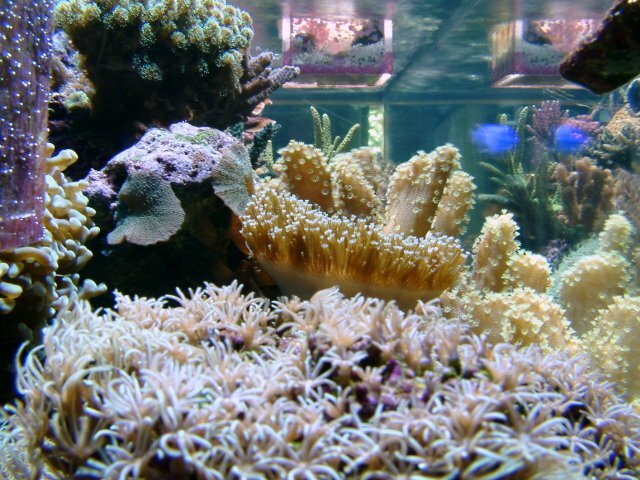 View from the end of the tank. 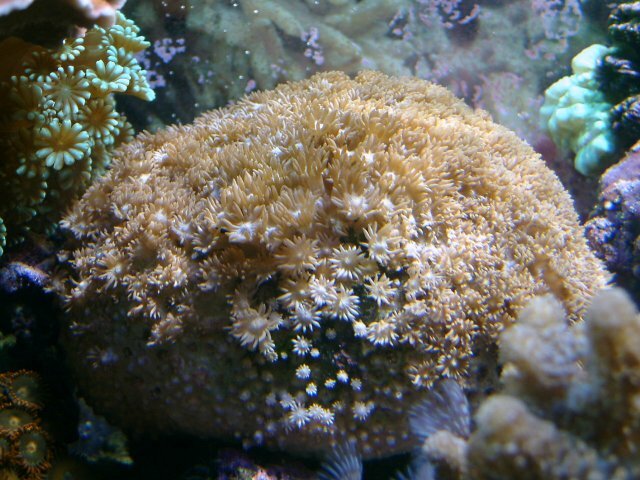 A rock or flower anemone. It is about 4 or 5" across, but doesn't grow any larger. The pink lips make it special because it really stands out. 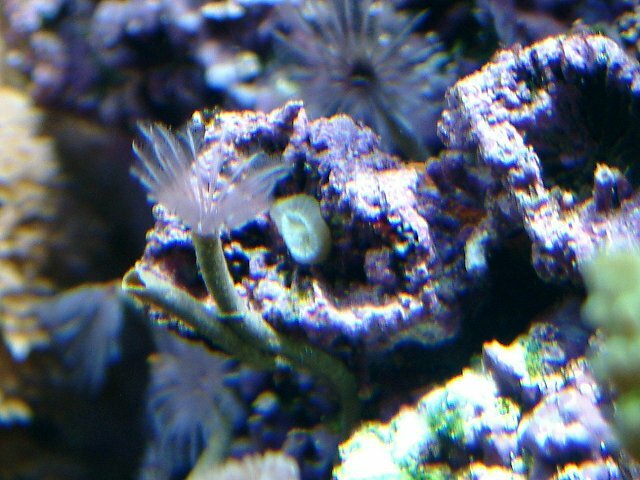 Another rock anemone. There is a brown growth of some kind above it, an that is why it doesn't open up fully. 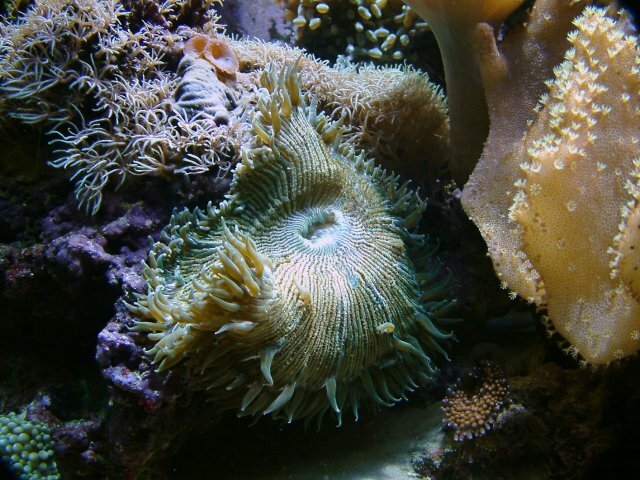 The Star Polyps don't help either. 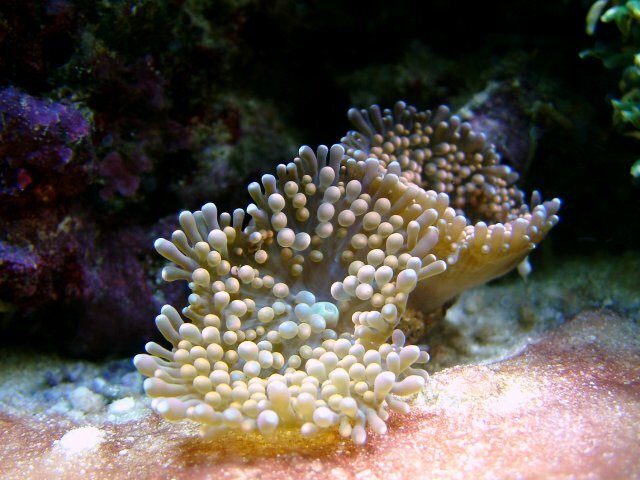 Neon-White Star Polyps. They look a little pink in this shot. 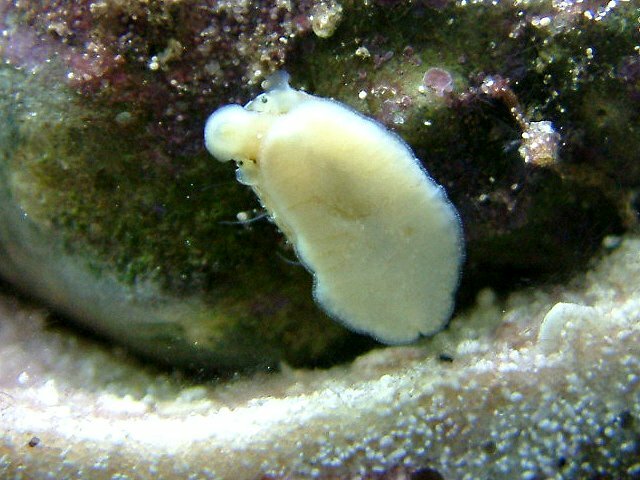 A stomatella was cleaning the glass. Normally they only come out at night. My suncoral when it is closed up, as usual during the daytime. A Tigertail Cucumber. 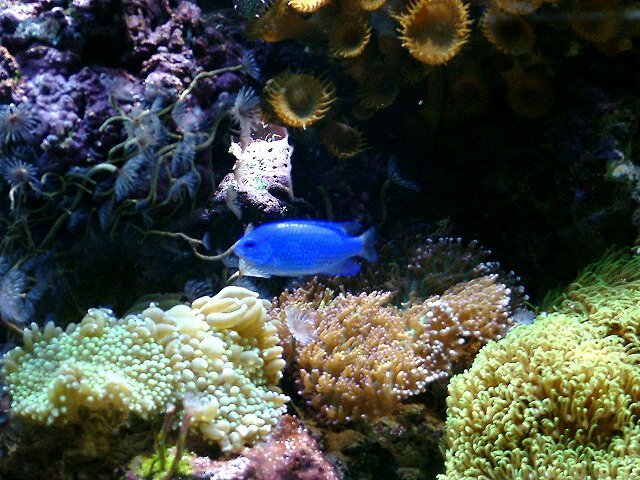 I had only one, and put it in my refugium, but after a few months it split, so I put one back in the display. 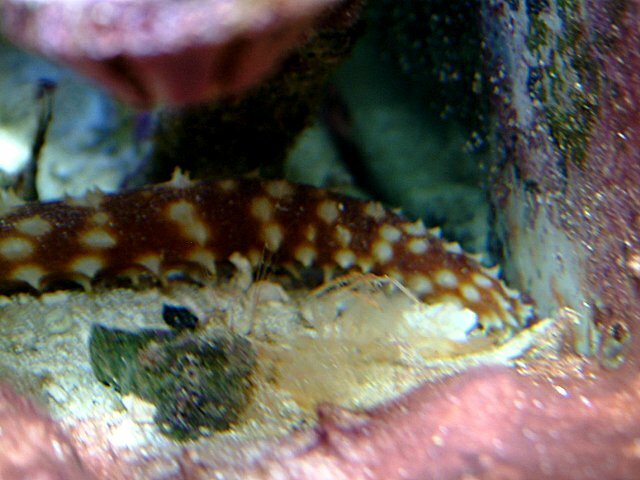 A molt from a Peppermint Shrimp is in the foreground. 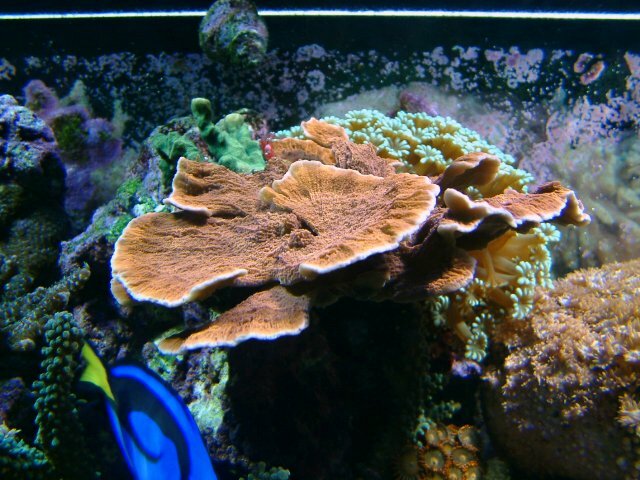 This Toadstool Leather grew from a small chunk or frag I brought back from MACNA last year. 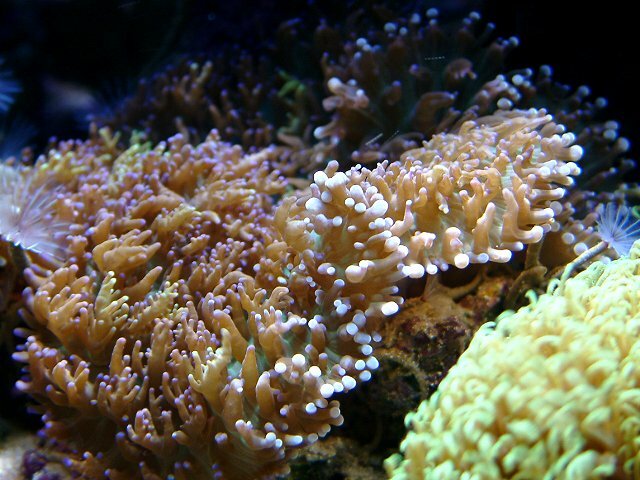 This Tri-color Acropora is simple gorgeous in person. Green at the tips, with purple branches and a golden brown trunk. It has tripled in size, in the past 6 months. A giant Turbo snail at rest. My Fighting Conch rests nearby. 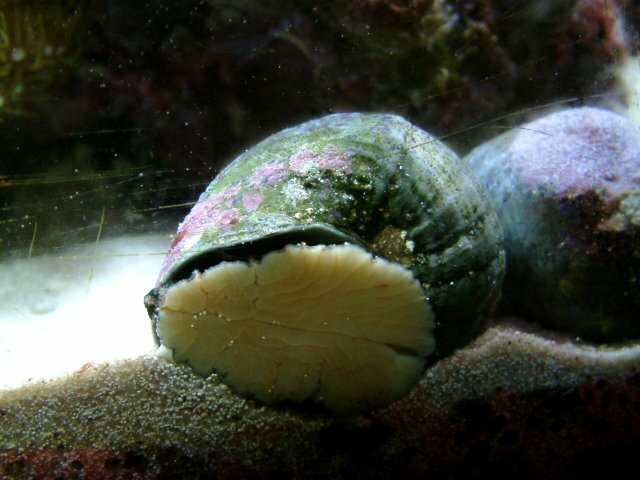 A Wavy Turban snail endeavors to eat algae along the edge of the return line, with 700gph pumping past him. He was holding on very tightly! 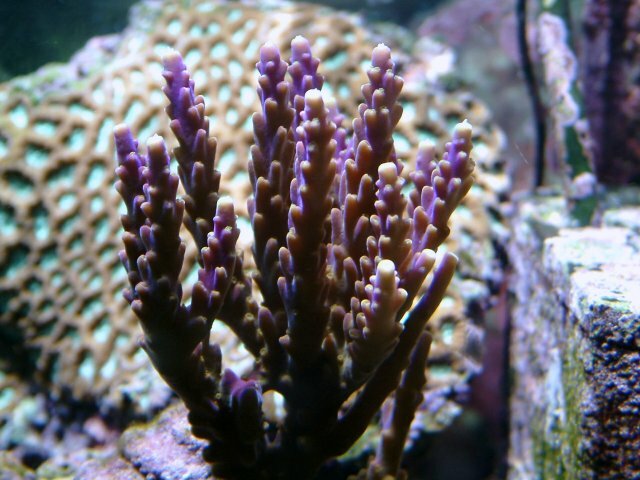 Bali Acropora tenuis - shot from above because it can't be photographed from the front of the tank, as another coral blocks the view. Posted 12 hours 17 min ago. Posted 14 hours 26 min ago.